The Grand Jury has jurisdiction to investigate and report on the “operations, accounts and records of the officers, departments, or functions of the county” pursuant to section 925 of the Penal Code. The offices under the supervision of the Amador County Clerk-Recorder were chosen for review this year based on the receipt of a citizen’s complaint alleging poor management and lack of organization. The Office of Amador County Clerk-Recorder is an elected position and is responsible for three distinct departments: the Elections Department, the Surveying and Engineering Department, and the Clerk-Recorder’s Office. In 1995, the three departments were moved to their current locations in the John C. Begovich Building. 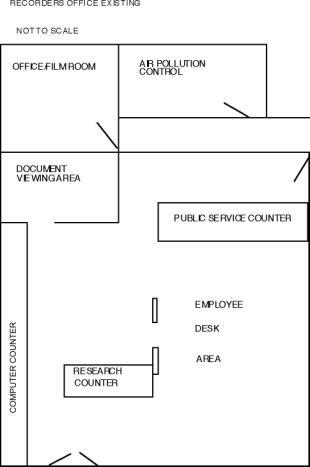 When the floor plan for the Begovich building was developed, the intention was that public access to the Clerk-Recorder’s Office would be through a separate, “side” door entering directly into that office. Shortly before the move, a decision was made to take a portion of the space allocated for the Clerk-Recorder and make it available for use by the Air Pollution Control District. It was also decided to route public access to the office through the main door located on another side of the building. The result has been a maze-like route through other County offices to get to the Clerk-Recorder’s office, Elections, and Surveying and Engineering. The rerouting of traffic required the design of the Clerk-Recorder’s workspace to be rearranged, creating a primary public walkway that cuts diagonally through the office. This reduces the available work and storage space. It has also resulted in the lack of a private office for the elected Clerk-Recorder. Members of the Grand Jury conducted interviews, reviewed documents, and visited sites. The Elections Department is responsible for all election-related functions including voter registration, scheduling the training of precinct workers, maintenance of computerized records and administration of elections. The 1990-1991 Grand Jury Report included an extensive, separately bound report about the election of 1990. At that time, Amador County was using a punch-card ballot similar to those that were used in Florida in the 2000 general election. The 2000-2001 Grand Jury determined that a review of the election process ten years later was appropriate. This Jury is pleased to report that all of the problems found a decade ago have been remedied. Voting is now done via an optical scan system, which has proven easy to use and has few problems. The vote can be entirely replicated, if necessary. Procedures have become well documented and well practiced. It is difficult to imagine an election going more smoothly than the Amador County General Election of 2000. With a voter turnout of over 82%, precinct results were completely tabulated by 9:38 p.m. The management and staff of Elections is commended for developing and operating the current system. Surveying and Engineering checks and reviews Records of Surveys, Parcel Maps, and Subdivision Maps for compliance with applicable laws, ordinances and established survey practices. The office also prepares and maintains master files of drawings, maps and specifications; does field and office work related to property and right-of-way boundaries; and provides assistance to the public, contractors, engineers, developers and various governmental representatives. The Deputy Clerk-Recorder functions as the County Surveyor. 1. An agreement was entered into in December of 1999 to upgrade the computer system that performs the map storage, printing, indexing, and cashiering functions within this office. 2. The computer upgrade agreement provides for payment of an annual service fee for a period of five years. 3. The computer hardware for the upgrade was purchased and delivered to the site in 1999. 4. As of June 1, 2001, the upgrade of the computer system per the agreement has not been completed. 5. The Deputy Clerk-Recorder’s job does not reflect any Survey-related functions. 6. In reviewing job descriptions, staff members were unable to correctly identify job descriptions for themselves or their co-workers. 1. It is not fiscally responsible to take eighteen months or longer to implement computer system upgrades. 2. Job descriptions that do not correctly reflect required duties hamper the County’s ability to recruit qualified new staff members. 3. Job descriptions that do not correctly reflect job duties create a potential for out of class job actions. 1. Make purchases and improvements in a timely manner once the decision has been made to purchase and implement technology improvements. 2. Review and modify job descriptions to more accurately reflect the duties of personnel within this Department. The Clerk-Recorder’s Office is responsible for processing and maintaining the Official Records, Vital Statistics and other records of Amador County. These non-court-related Clerk functions include, but are not limited to, the processing of: birth, death and marriage records; passport applications; notary and other bonds, fictitious business names; and the registration of unlawful retainer assistants, process servers, and legal document assistants. Many of these documents are confidential or sensitive in nature. The elected Clerk-Recorder is also the Commissioner of Civil Marriages. The Clerk-Recorder’s office houses the grantor/grantee indices, which must be available for public access. New computers were installed for public use in early 2001, significantly improving access to the indices. There are four employees in the Clerk-Recorder’s Office: one Fiscal and Technical Services Assistant (FTSA) I; two FTSA II’s; and one FTSA III. Among their other duties, these positions require extensive knowledge of legal documents pertaining to real property. Historically, the Clerk-Recorder’s staff has been hired from a candidate pool previously trained by the title insurance industry. As the title industry has changed, this source of job candidates has been steadily depleted. Amador County has no general information number. Telephone operators often refer callers to the first number on their listing that appears to be relevant when callers are unsure of what public office they should contact. The Clerk-Recorder’s number is high on the listing. Many of the misrouted calls are meant for the Court clerks because of the similar title. The Court has an automated phone system that can prove trying to the public. This often results in the Clerk-Recorder’s office receiving yet another phone call from a frustrated citizen for whom they can do nothing. The four positions in the Clerk-Recorder’s office have jobs requiring extensive interaction with the public. Unlike other offices, where clerical functions are clearly separated from more specialized tasks, all employees perform the same basic duties. The current job descriptions are generic and do not accurately reflect the variety of duties and responsibilities for the positions. The organization chart is inconsistent with the actual operations and functions of the office. The Amador County Budget shows the cost allocation for the Chief Deputy Clerk-Recorder/Surveyor position is 4% from the Clerk-Recorder budget, 17% from Elections, and 79% from Surveying, a rough indication of how the duties for this position are weighted. The job description for this position makes no reference to responsibilities in Surveying, and the organization chart shows equal supervisory responsibilities for all three departments. The job description does not indicate supervisory duties for any Fiscal and Technical Services Assistant positions. It stipulates the person must be able to answer questions regarding the Clerk-Recorder’s Office, and to “oversee the receiving, review, and processing of property and title documents.” Oversight of Elections and Surveying does not allow sufficient time to participate in the continuous training process required to stay abreast of all the Clerk-Recorder’s tasks. 1. Professional staff and members of the public requiring the services of this office routinely enter through the Begovich Building side door, then pass through the employee workspace to other areas of the building by means of the interior, public access door. 2. The current public access pattern makes arrangement of staff workspace difficult. 3. The elected Clerk-Recorder must use the storage and microfilm room to conduct private business. 4. The documents processed in the Clerk-Recorder’s office are sensitive and confidential materials. 5. In reviewing job descriptions, staff members were unable to correctly identify job descriptions for themselves or their co-workers. 6. Staff members’ understanding of the organizational structure was not consistent with the existing organizational chart. 7. Lead advisory responsibilities and much of the secondary supervision are performed by the Fiscal and Technical Services Assistant III in the Clerk-Recorder’s office. 8. There is a backlog of archival and research work that cannot be accomplished due to the current workload and high volume of direct and telephone interaction with the public. 9. The elected Clerk-Recorder often stuffs envelopes, reviews microfiche and performs other clerical tasks due to the high volume of work. 10. After one to two years of working in the Clerk-Recorder’s Office, the FTSA I performs the same tasks as the FTSA II’s. 11. There is a high volume of direct and telephone contact with the public. Many of the phone calls are misrouted. 12. 4.17% of the Chief Deputy Clerk/Recorder position’s budget allocation is to the Clerk Recorder’s office. 1. The traffic pattern flows through the office from both public access doors, cutting diagonally through the cramped employee workspace and exposing sensitive materials to public scrutiny, resulting in a potential compromise of confidential and vital documents. 2. The storage and microfilm room is not an appropriate area for the Clerk-Recorder to conduct confidential business. 3. Job descriptions that do not correctly reflect required duties hamper the County’s ability to recruit qualified new staff members. 4. Job descriptions that do not correctly reflect job duties create a potential for out of class job actions. 5. There is no provision for the entry-level position to receive equal pay for equal work after the passage of an appropriate training period. 6. There is a need for a formalized lead position to attend to advanced archival and research requirements and that can be isolated to some extent from the phone and public contact duties. 7. A clerical position is needed to handle general telephones, filing, and other tasks that are currently being performed by managerial staff. 8. The organization chart is inconsistent with the actual operations and functions of the Clerk-Recorder’s office. 9. Designating supervisory and advisory tasks in an office to a position whose cost and presumably time allocation is less than 5% is not judicious. 10. The complaint’s charge of lack of organization is supported by the discrepancies in the organizational structure and job descriptions, management’s performing clerical jobs, and insufficient personnel to handle the workload of this office. 1. Move the Air Pollution Control office. 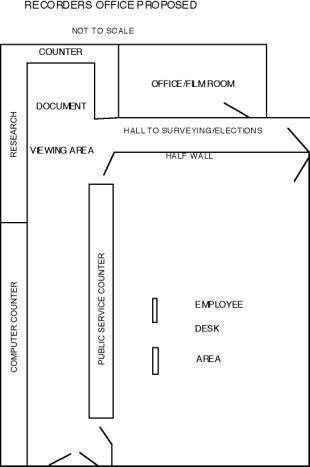 Use the vacated space for the Clerk Recorder’s private office. 3. Review and modify job descriptions to more accurately reflect the duties of personnel within this Department. 4. Review and modify positions so that people doing equal work are making equal pay. 5. Identify a lead position with less direct public contact to accomplish the advanced research and archival needs of the office. 6. Coordinate with Courts and Data Communications to address the volume of misdirected telephone calls or establish a clerical position in the Clerk-Recorder’s office to direct phone calls and attend to other support functions. 7. Review the existing organizational structure and adjust the organizational chart to more accurately reflect present conditions (see charts below). As required in Section 933.05 of the Penal Code, the Amador County Clerk-Recorder and Board of Supervisors must respond to each finding and recommendation in the manner indicated on page one of this report.